“Hansel and Gretel” is a German fairytale that was recorded by the Brothers Grimm in their 1812 collection of folklore, Children’s and Household Tales. 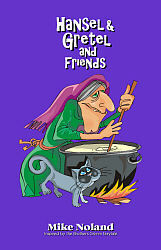 In the Grimm’s version, the woodcutter’s wife is Hansel and Gretel’s biological mother. In later editions, the mother becomes a stepmother. The story is thought to be a cautionary tale for children that originated during the period of the Great Famine (1315-1321) in which desperate parents abandoned their children to fend for themselves.